Last updated on April 9th, 2019. 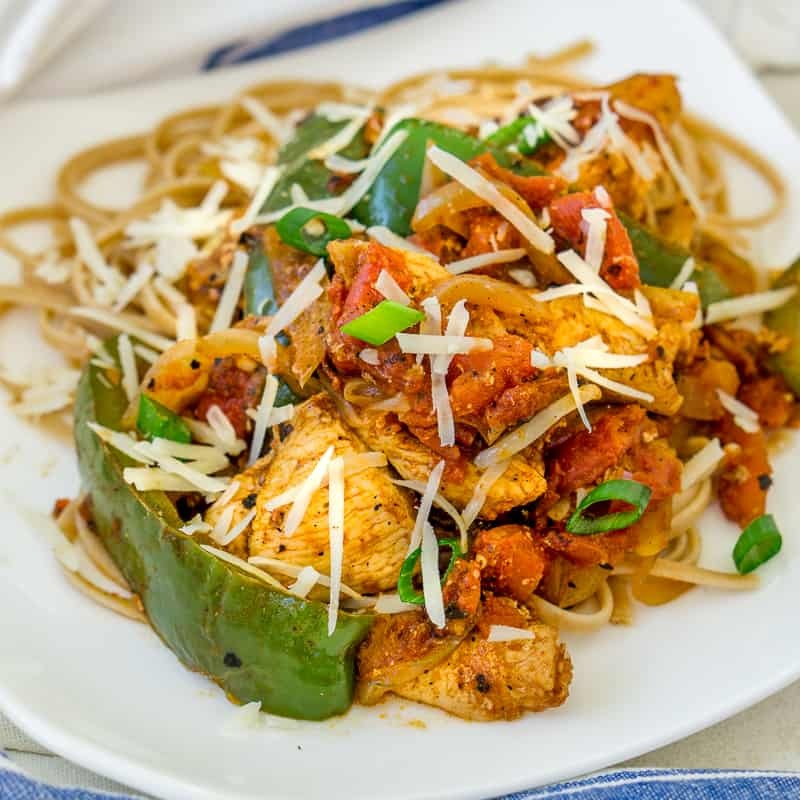 A one-skillet recipe for Garlic Chili Chicken and Peppers with a delicious spiced tomato sauce to spoon over your favorite side dish. This post contains affiliate links. See my disclosure. I am the queen of one-pan recipes lately! I just haven’t been feeling up to making elaborate dinners that take up every burner of my stove. I want quick, flavor-packed dishes. 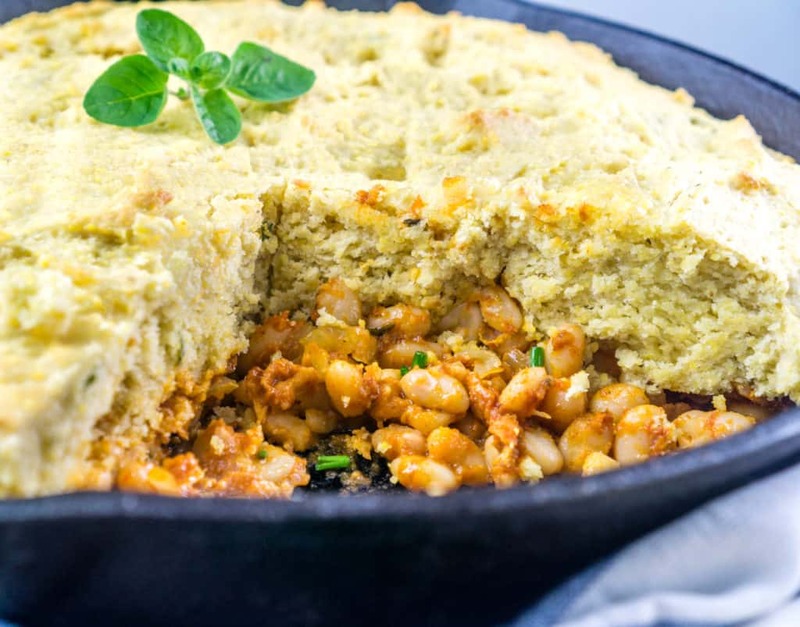 Luckily there are a ton of recipes you can make in about a half hour in just one skillet. 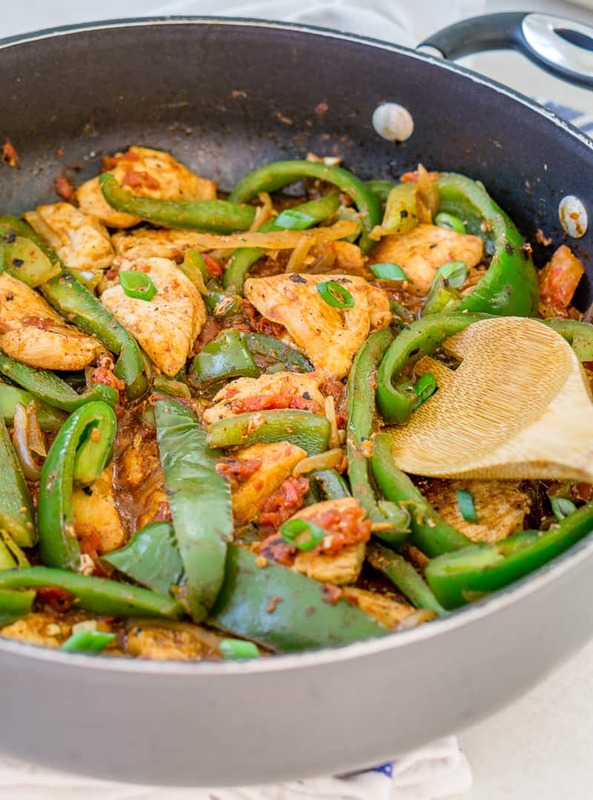 This Garlic Chili Chicken with Green Bell Peppers is one of my favorite recipes. It is super easy to prep and cook. You can chop the chicken, start cooking it, and then slice the green peppers and onions while the chicken is cooking. 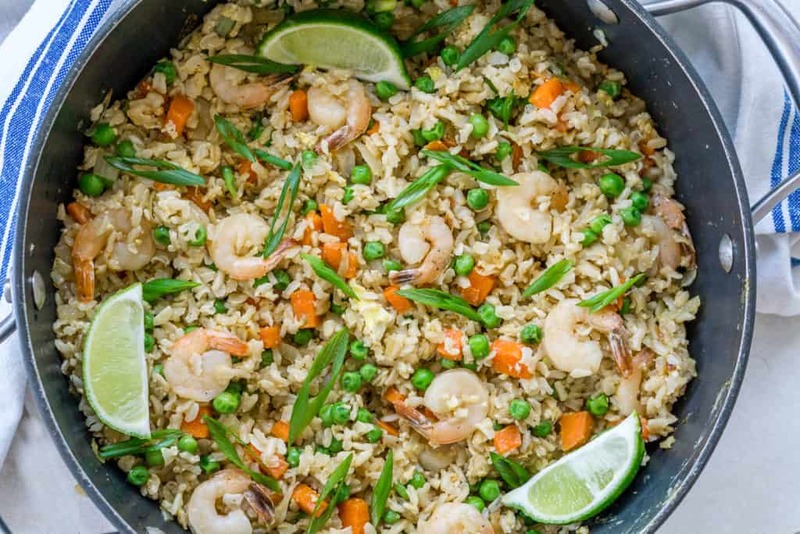 Everything goes into one pan and the garlic and chili powder really add a flavor punch to the whole recipe. 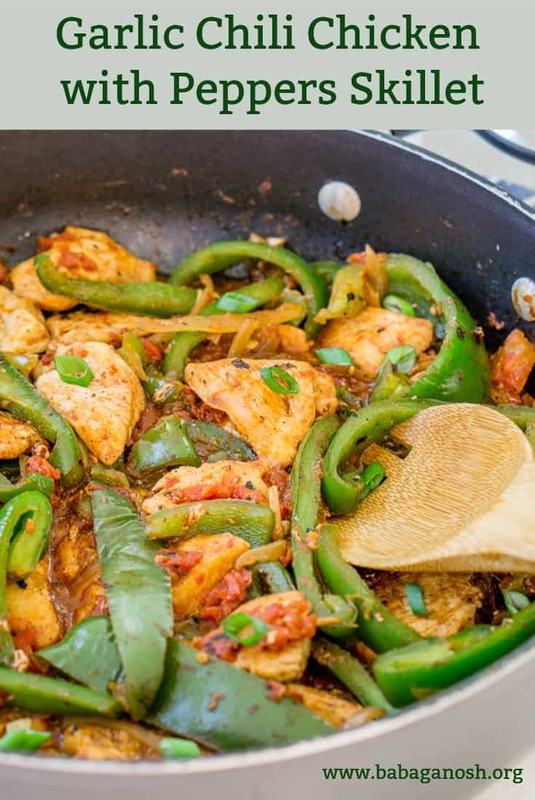 What makes this Garlic Chili Chicken and Peppers Skillet extra tasty? The sauce in this Garlic Chili Chicken recipe is made from fire roasted diced tomatoes. I love using fire roasted diced tomatoes because the blackened roasted tomatoes add a whole other level of flavor to my dishes – there is a sweet and smoky flavor to the fire-roasted tomatoes that you don’t get in the regular diced tomatoes. So don’t skimp on the fire roasted tomatoes in this recipe! 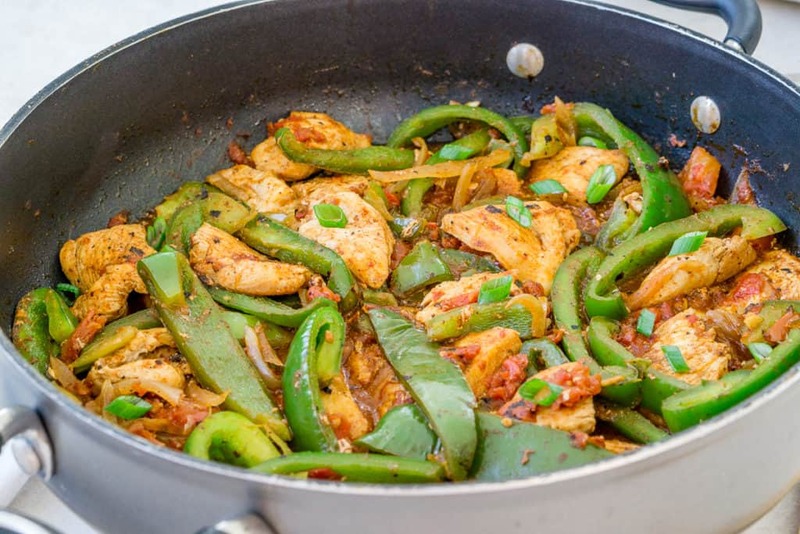 The garlic, onions, and peppers are added in the last step of the recipe, which means that they give the whole dish an extra boost of flavor because they are not overcooked. The bell peppers and onions stay nice and crisp, and the three garlic cloves give everything a wonderful garlic aroma without being overpowering. Fresh chili powder without added salt is also key to maximizing the flavors of this dish. Here is a great recipe for homemade chili powder mix if you want to make your own, but of course you can also buy chili powder. I like this one here from Simply Organic because it doesn’t have salt added. That way you can add lots of it to get all the flavor without making your recipes too salty. For this dish, you can use either one or two cans of fire roasted diced tomatoes – it all depends on what you will serve this with. If you want to make sure you have lots of sauce to serve with pasta, rice, or polenta then I recommend using two cans. If you are serving this with a side that doesn’t need too much extra sauce (such as roasted potatoes), then you can easily use one can. It’s totally up to you, and the cooking directions are the same whether you use one or two cans. 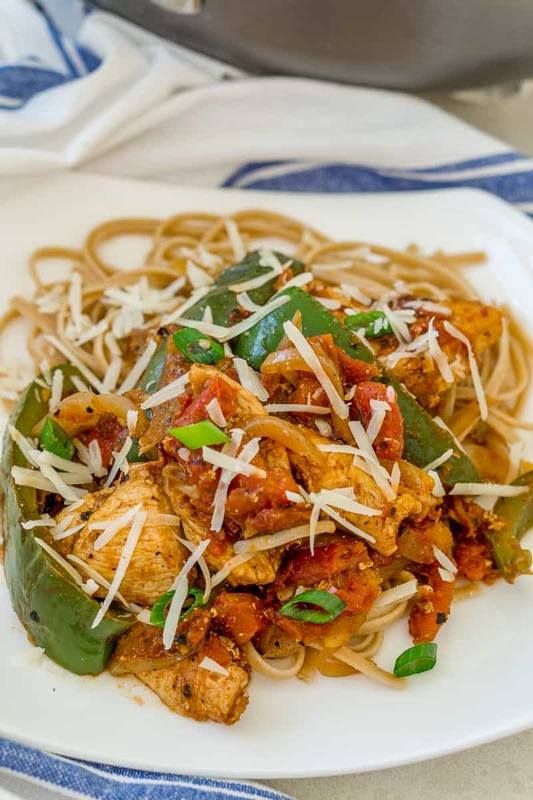 I recommend topping this Chicken and Peppers dish with some freshly grated Parmesan cheese. Parmesan adds a bit of savory, nutty flavor to the dish that works wonderfully with the warm spicy flavors of the recipe. 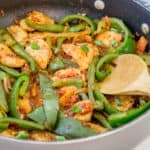 So if you are looking for a little something different, a little something delicious, and a very simple dinner, you should give this skillet dinner of garlic chili chicken and peppers a try. Let me know in the comments if you make this, I love to hear from you! If you enjoyed this recipe, don’t forget to give it a rating below and save it on Pinterest for later! In a large bowl, combine the chicken breast, salt, pepper, and chili powder and mix well. Heat the vegetable oil in a large skillet, and add the seasoned chicken to the skillet in a single later. Cook for 7-10 minutes over medium heat, stirring every few minutes. Add the sliced bell peppers, sliced onion, and minced garlic cloves, and stir well. Add the diced tomatoes (including the liquid - see notes!) and stir. Cover with a lid and allow to stew for about 5 minutes, or until the peppers are cooked to your liking and the chicken is fully cooked. Stir well and remove from heat. Serve hot, spooning the extra tomato sauce over pasta, rice, polenta, or your favorite side dish. Top with freshly grated Parmesan. You can use one or two cans of diced tomatoes - your choice. Use two cans if you would like extra sauce to spoon over your side dish, or use just one can if you are serving this with a side that doesn't need extra sauce. * Percent Daily Values are based on a 2000 calorie diet. The nutritional information shown here is just an estimate and not meant to be used as dietary/nutritional advice. Actual nutrition and calories may vary. If you require exact nutritional information, please check the nutrition facts of your actual ingredients. 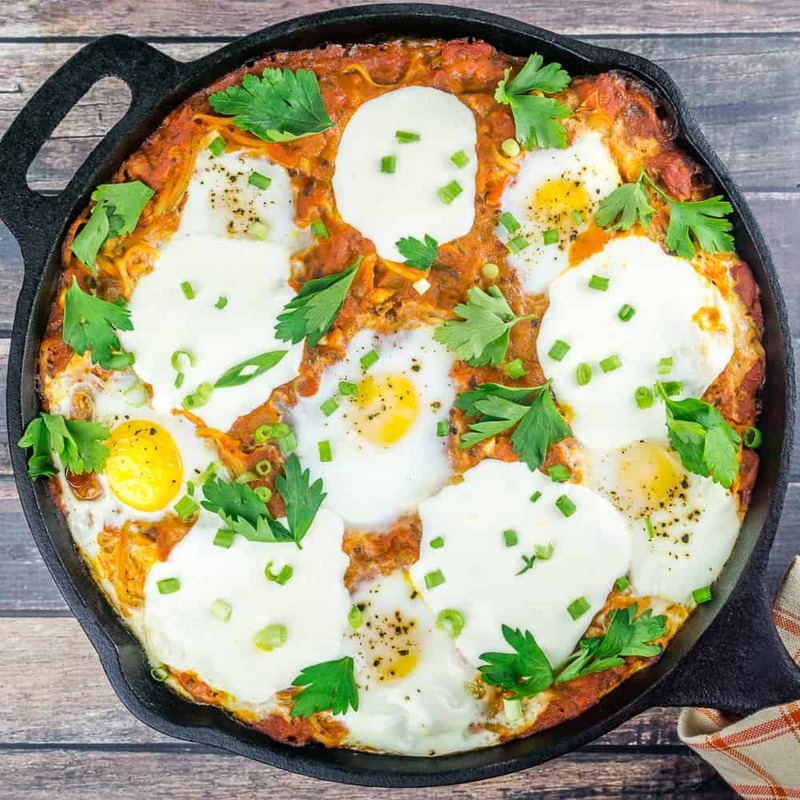 Hungry for more easy one-pan meals?